Apple has released the second beta versions of OS X 10.11.5, iOS 9.3.2, WatchOS 2.2.1, and tvOS 9.2.1. The updated beta releases are available now to individuals running the prior beta builds. The beta point releases are generally aimed at resolving bugs and improving performance with each respective build of system software, and it’s unlikely that any significant new feature will show up in the software releases. 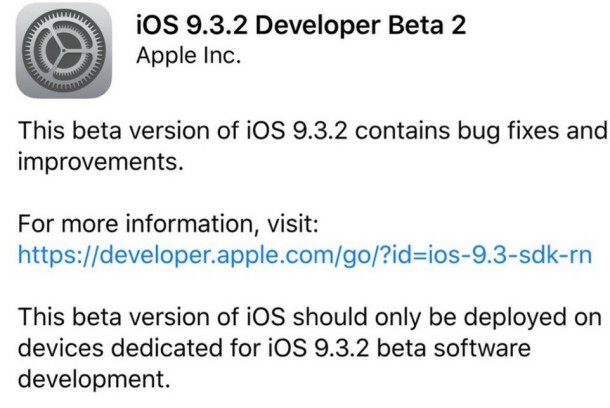 For iOS 9.3.2 beta 2, some minor adjustments to existing features have been noticed, like the ability to enable both Night Shift mode and Low Power Mode at the same time on an iPhone or iOS device, a function which is currently limited to either of the useful features but not both concurrently in iOS 9.3.1. For Mac, OS X 10.11.5 beta 2 will hopefully address some of the ongoing difficulties facing a select group of users with problematic Safari and OS X 10.11.4 experiences. 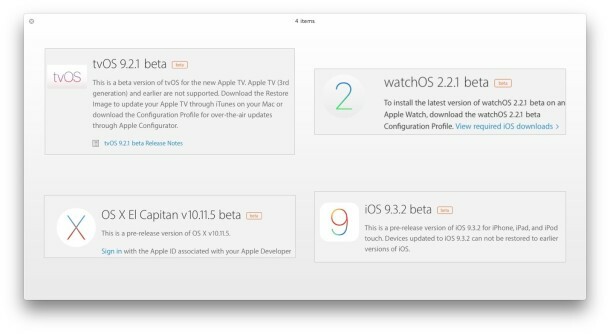 Users who are enrolled in the developer beta programs can download the beta builds right now through the Over The Air Software Update mechanism on their various iOS devices via the Settings app, Macs through the App Store, Apple Watch through their paired iPhone, or Apple TV through the Settings app. Public beta builds of iOS 9.3.2 beta 2 and OS X 10.11.5 beta 2 are to follow shortly behind, as usual. Apple typically goes through a half dozen beta builds of operating system software before releasing a final version to the general public. Anyone can choose to enroll in the public beta programs, but given the less-than-stable nature of beta releases, it’s generally only recommended for advanced users or for secondary devices. As I read this, Safari has crashed multiple times today already, and it’s not even 11 AM. Safari spends most of the time showing it’s beloved rainbow spinning cursor, multiple Safari windows are unresponsive for no apparent reason, and OS X 10.11.4 can’t figure out how to handle Time Machine backups that have worked flawlessly for years. When I answer a phone call to my iPhone 6S with iOS 9.3.1, the screen freezes for 5 seconds or so and offers no indication that a call has been answered, nonetheless the microphone is live and transmits whatever cursewords you offer to the bugged out experience. I have coworkers that experience the same issue, and others whose touch screen is just unresponsive in general. The quality of software coming out of Apple is degrading faster than anything I have ever seen before. Apple has the resources, but what they don’t have is the concern. Are you aware, that these are beta software to let the beta testers test them and don’t reflect the quality of a final product? Can anyone who has this latest beta know or have on info one the Bluetooth issue suffered by many SE owners. Me being one of those SE owners. True, not at the moment, it seems. Apparently, they’ve decided to jump to the next beta round instead. As for BT issues, I’m having none on my iPhone 6, but the SE has been known to have some since it has been available. Can anyone tell me if they are going to bring the drag and drop from Contacts to Pages back? I can’t update my Mac’s because the latest OS and Pages don’t have this feature. Also does anyone who has used this essential feature know a way to do the same thing another way? Maybe if enough people complain to Apple they could put in back into this new version they are Beta testing.